The world is changing quickly; so fast, in fact, that it’s hard to keep up. It seems everything is being reinvented in some way, and with that progress, brand new horizons constantly unfold. Technology has changed fishing in many ways for example. Rods are lighter, stronger and more specialised, while reels now feature highly developed composite engineering. There’s a different hook, lure or teaser for every minute of the day and even our bait processing and presentation has leapt ahead in bounds. Combine all this new technology with modern electronics, boats and fuel-efficient outboard technology and the mysterious world that once hid in the ocean’s deep abyss has suddenly opened to our modern fishos. Australia’s Continental Shelf is a demanding place to be a trailerboat fisherman. It is a long way offshore and the closest access ports have become sportsfishing meccas, with more spots being explored every day. Yet the Shelf has become a new frontier for private boats and charter vessels. Doing it for yourself is perhaps more satisfying, yet charters can work out cheaper in the long run and mostly guarantee more opportunities for success. Until recently most offshore sport and gamefishing was based on dragging surface lures or berleying on the drift with both live and cube baits. Prime targets were pelagic marlin, tuna, sharks and others that cruise the shelf – we didn’t have the technology to get down deep. Surface fishing was often fruitless and frustrating, especially on the calm days when the fish tend to dive deep. Our tackle was mostly monofilament lines that just didn’t have the capacity to get a big bait down to the depths, and even if it did, the amount of line stretch (combined with physically winding such huge lengths of line) made it all too hard. Professional boats used deck winches and big drum reels for the task, but even then getting a bait down 600-800m was very difficult. We fishos are an inventive lot and the answer was at hand, but still in its infancy. When electric reels were first introduced, most of us didn’t understand the concept, nor the availability of deepwater target species. The advent of braided or fused lines gave enormous strength with very thin diameter and almost no stretch – they were a real game changer. All of a sudden, we could not only fill realistic sized spools with extremely long lengths of line, but we could do so with heavy weights and big baits. Fluorocarbon end traces have provided virtually invisible hook presentation at the business end with terrific wear and bite resistance, without resorting to wire. 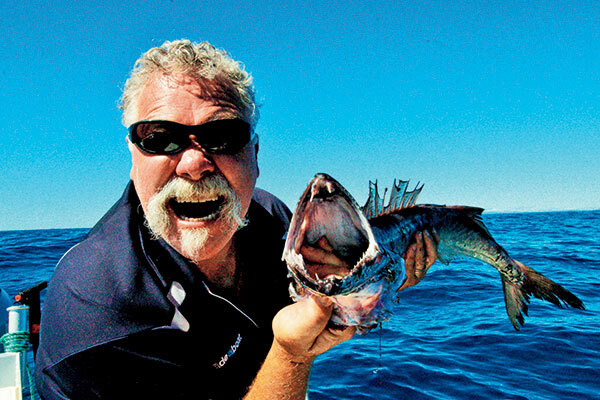 Most fish species in these deepwater environments have very large eyes, but more importantly big teeth, so tough terminal tackle is essential. I have just returned from another trip to the beautiful waters of Tasmania – a destination I love dearly, yet haven’t had enough time to explore. I was totally blown away by the majesty of the coast between Eaglehawk Neck and Tasman Island on my previous trip, and had some of my first attempts at deep dropping for broadbill swordfish in the depths some 15-20nm seaward. We did hook up to what we think was probably a broadbill on that adventure and I struggled to fight the fish to within 100m of the boat until disappointment raised its ugly head. The big hook pulled out, giving the unseen denizen its freedom. Bicheno was the destination for my next stop, a beautiful little coastal town on the north-east coast of Tassie. 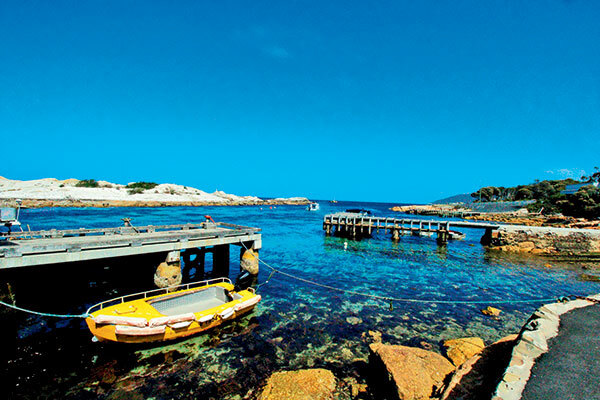 Bicheno is a terrific little town, with a host of attractions for the visiting camper, angler, or in fact anyone who loves the outdoors. 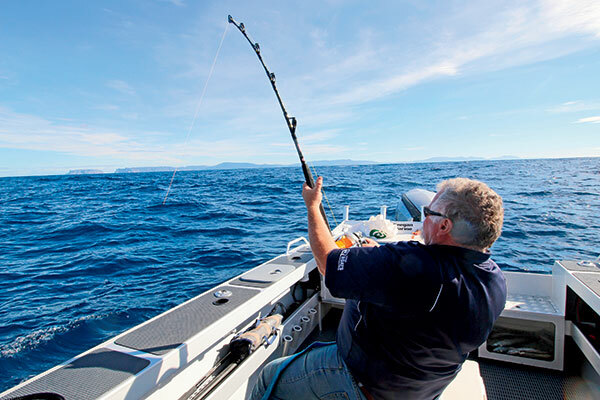 Our deep dropping here ranged from 100-700m using electric reels and we enjoyed great success – a bag full of delicacies including gemfish, blue eye trevalla and some of the fattest tiger flathead I have yet encountered. These deepwater cool climate species taste terrific, and the beauty is that you can run a berley slick for a big mako, or cube for southern bluefin tuna all at the same time. While deepwater dropping is still just in its infancy, the results speak for themselves with great success being achieved. And we are having all this fun without physically turning a handle on a reel or picking up a rod from a holder. Meanwhile, broadbill remain my piscatorial Holy Grail. I just hope there’s enough life left in me to achieve it. I’m having loads of fun trying though! The full feature appears in Caravan World #561. Subscribe today for the latest caravan reviews and news every month!